How can you correspond with your customers and resolve issues? iScripts SupportDesk includes a variety of options. With just one click, you may adjust the following features within the powerful administrative control panel. Ticket Submission - Your customers can submit trouble tickets through web based forms, which will require sufficient information to be provided for you to address the issue. Email Piping - With this feature, customers can email you with service or support issues. 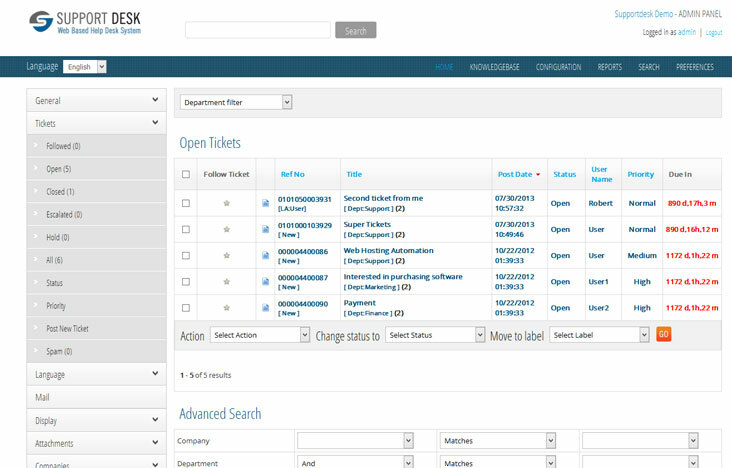 The software will automatically create a ticket in the help desk system from that email. These tickets can also include attachments. The software supports SMTP and POP3. Live Chat - Allow your customers to communicate with your staff through live chat. To better assist customers and offer the best experience possible, techs will be able to find the past history of each client within the database. Flexible Knowledgebase - Offer an area for your customers to discover information on their own. Create unlimited categories and FAQ entries that answer questions for silent questioners. Announcements/ News - Let your users and staff view important notifications in the News section. Response Templates- Store predefined replies to respond to users quickly. Save time by reusing them! Personal Notes on Tickets - Add a special note to each ticket in order to stay up-to-date with facts and details. Service-Level Agreement Functionality- Formally define measurable response times to ensure quality for your customers. When the set service-level agreement is not met, the system will automatically escalate the ticket. 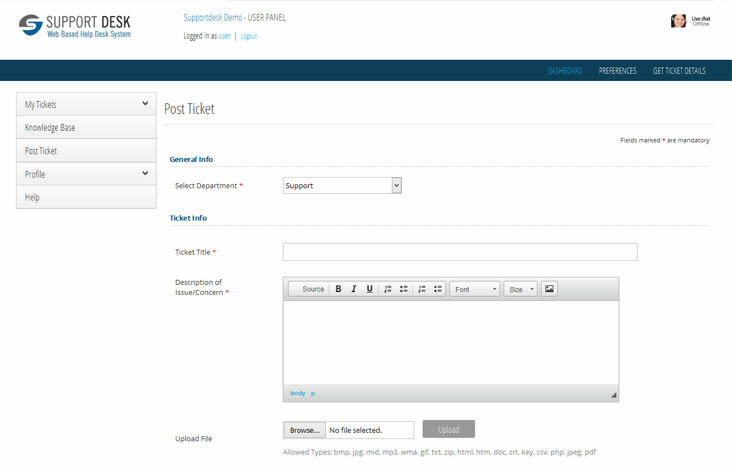 Workflow and Rule Management- Assign tickets to specific staff members. 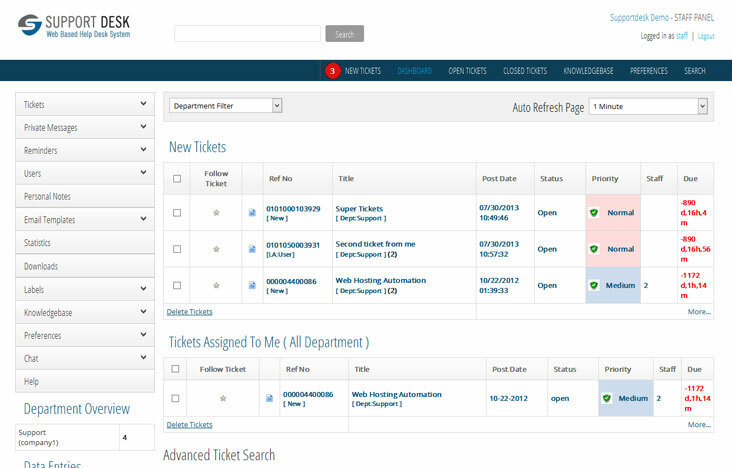 The software automatically calculates the amount of time staff members devote per ticket. When a ticket is closed, an email is sent to the user with a link to rate the staff member and experience. Knowlegebase Assimilation- Knowledgebase entries are now SEO friendly and can be used to cut support costs. Staff members can add replies directly from the Knowledgebase instead of spending time to manually create duplicate replies. Message Labels- Categorize tickets through labeling. Watcher Feature - Monitor communication between staff and users on specific issues of your choice. Spam Blocker - Avoid receiving huge junk emails as tickets. Reminders - Stay organized with reminders. Set the time for your reminders to stay tuned. Private Messages- Send private messages among staff with a built-in internal messaging system. Ticket Purging - Reduce your system load by purging older tickets out of the database. Activity Log - View the activity log to see what's currently happening. Mass Mail - Send email to groups of users within a single click. Downloads - Share common files such as manuals and instructions with your staff in the download section. Advanced Search for Tickets - Find exactly what you need with the help of the advanced search feature. 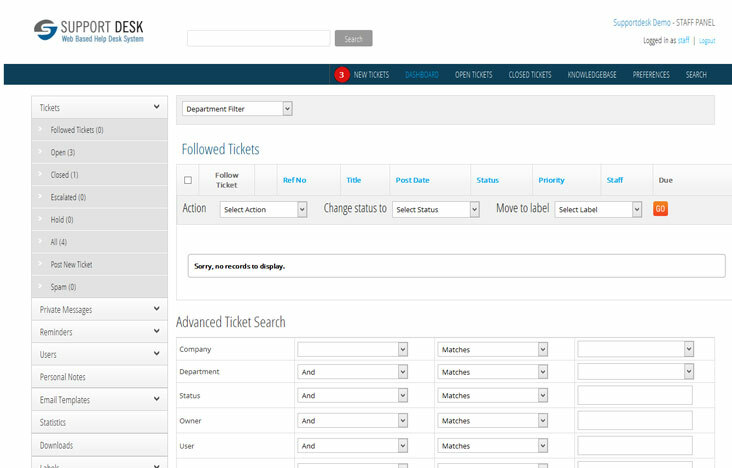 Search by multiple fields such as user email, words, phrases, ticket status and more. Quick View Statistics - View ticket and staff statistics in a graphical manner. 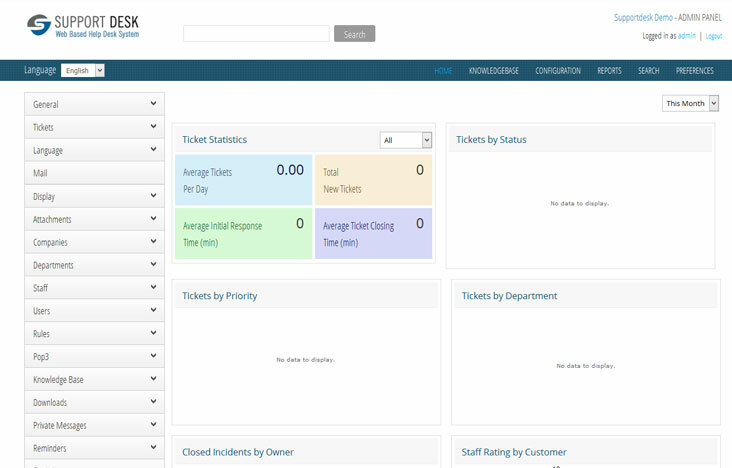 Custom Statuses for Tickets - Customize the status of your tickets to comply with your industry jargon. Multilingual Support, The software is preloaded with language packs in English, German, French and Spanish. Multiple Themes - Choose the dynamic layout that best fits your site. CMS (content management system) - Use the CMS to edit all text and copy on pages of your site. Staff Personalization - Each staff member can change certain points of his/her account to suit his/her needs. Unlimited Multi-Level Departments - Create any number of departments to reflect your organizational structure. Unlimited Multi-Level Knowledgebase Categories - Organize your knowledgebase entries into multiple multi-level categories. Unlimited Staff/Users - Create any number of staff members. Number of users registered to and using the system is also not restricted. This is an open source script without code encryption which means you may customize the site at any time in order to fit specific site needs. Use your own programmer or contact us for a reasonably priced customization quote.